Home › C# › Adding a map image to a secondary live tile. 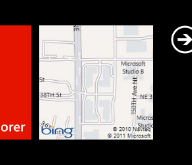 Does your app use live tiles to pin a tile that relates to a location that has a known Latitude and Longitude? If so did you know that it is easy to have a map of that location appear on that tile. This is done by using the Bing maps imagery service. As you can see both the BackgroundImage and BackBackgroundImage take a Uri in the code above. The Uri above is specified as Relative this means that the images can be located within the apps content (as part of the XAP file) or within the applications isolated storage. You are however not restricted to relative Uri’s you can specify Absolute Uri’s for the image. This opens up the ability to have the image come from an external web server. This is where the Bing maps imagery API comes in. The lat, lon and key variables have all been set prior to calling this code. As you can see this is a rather simple way of adding some extra information to one of your tiles. In the next blog post I hope to extend this further and add some additional graphics to the background. I will also be making use of the powerful WP7Contrib library.